Polka Dot Overload | Sewing, knitting & vintage projects, tips, tutorials and cartoons! 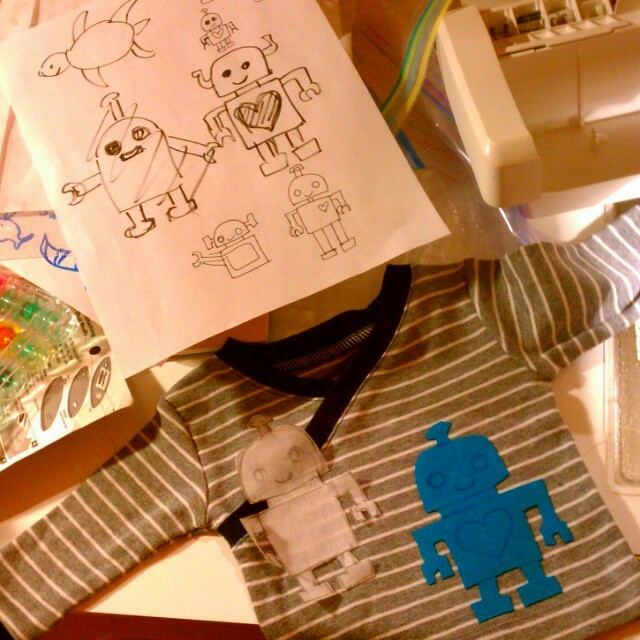 : Last-Minute Baby Sewing Binge (Before Being Stuck in Bed) — With Tools and Robots! Last-Minute Baby Sewing Binge (Before Being Stuck in Bed) — With Tools and Robots! Up until last week, the only item I had actually finished for Baby Wood was a single pair of Better Than Booties baby socks (the green ones shown above, Raveled here). Then I looked through my stash of newborn and tiny baby items and completely panicked, because I have almost NO gender-neutral clothes for tiny babies (what if we have a boy?! ), and very few warm winter clothes (Z was a summer baby). I made a thrifting expedition and scored 15 cute little second-hand gender-neutral baby things for $26, but dressing baby in store-bought clothes isn't as SPECIAL or FUN as putting him/her in something me-made, now is it? So I ramped up my baby knitting queue... and last Sunday, while the four-year-old was visiting her grandparents, I went on a bit of a mad sewing binge, tracing, cutting and sewing seven little itty bitty baby garments in one day--more than I've sewn in one day ever, and more than I've sewn for months total. AND all the fabric and patterns had been in my stash at least four years, or were secondhand, so—SCORE FOR STASHBUSTING and CUTTING UP OLD CLOTHES TO MAKE NEW ONES. 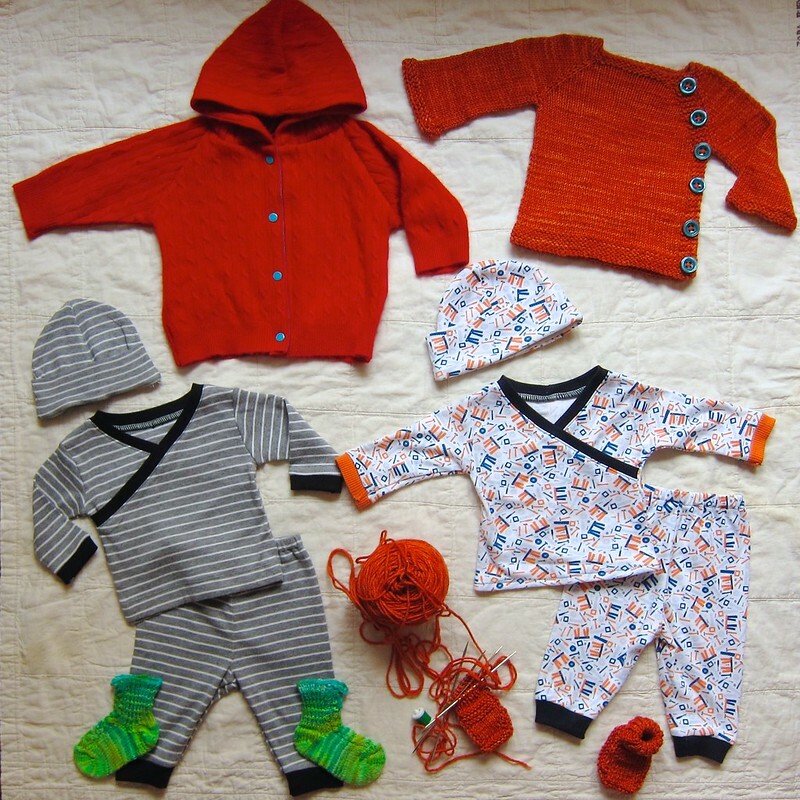 Mainly, I wanted to make some cute, snuggly, special baby outfits for the new one to wear home from the birthing center. 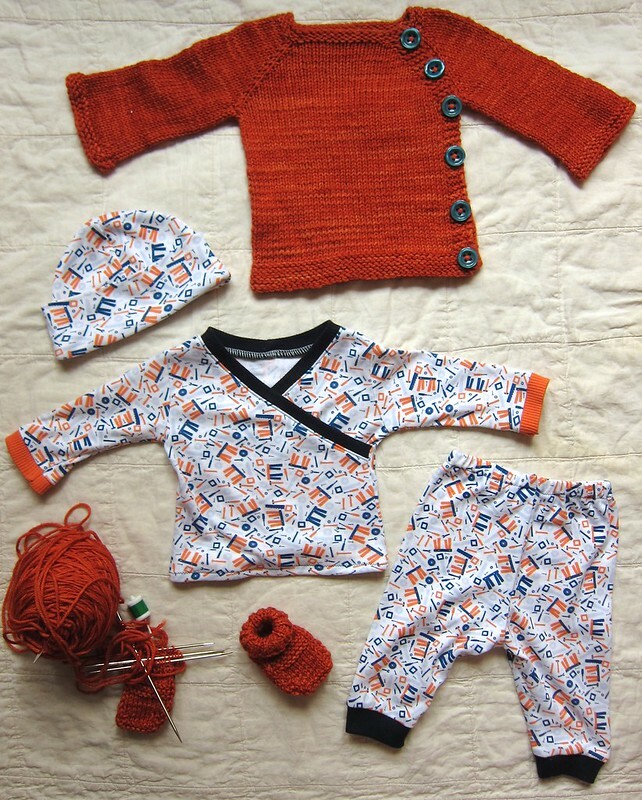 Set #1: Orange overload: A little cotton kimono knit top with contrast ribbed bands and cuffs in an orange tool-themed print with matching pants and hat, plus an orange merino wool side-buttoning cardigan and little wool booties (in progress). The kimono top and pants are from the wonderful New Conceptions Baby Essentials layette sewing pattern set. Kimono tops are great for pulling over big wobbly newborn heads, and I love that the sleeves and pants are finished with cuffs instead of hems—I highly recommend this easy and versatile pattern. The main fabric is a soft cotton interlock with a tool pattern I bought ages ago from the Fabric Fairy, and the navy and orange ribbing were from a Sew Baby ribbing color assortment. I made the newborn size, and sewed everything but the top hem and the pants waistband on the serger. The super-simple hat pattern is part of Kwik Sew 2433, another great knit baby clothes layette pattern for rompers, jumpsuits, hats and booties. The side-buttoning cardigan is the Beyond Puerperium cardigan pattern, a fun and simple raglan sweater (the newborn-size Puerperium is free, but I bought the version with more size and yarn weight options). The yarn is Malabrigo Rios in the color "Glazed Carrot", a soft, washable, squishy worsted-weight merino yarn. (Cardigan raveled here with full details). The in-progress booties are knit from the free Gansey Booties pattern in the same yarn, and I have an earflap hat in progress (the free Aviatrix hat pattern) as well to finish off the ball. 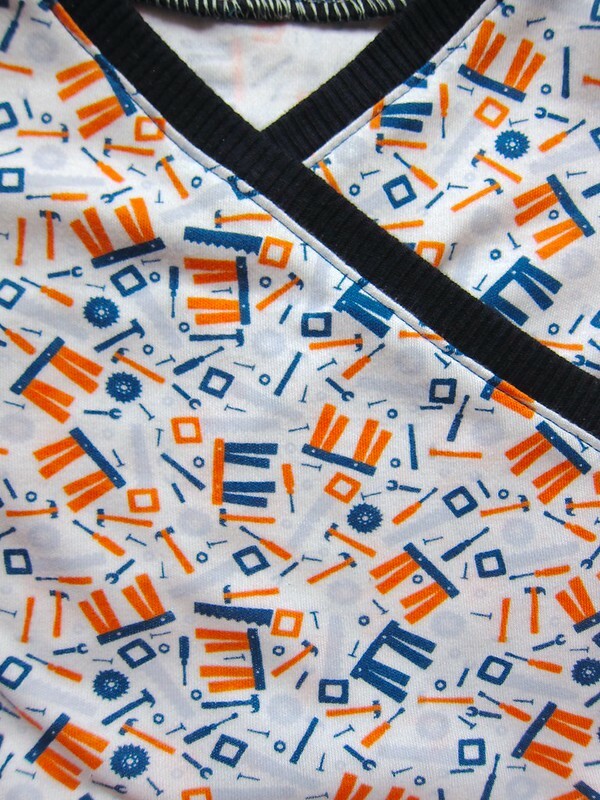 I just love the tool pattern on this fabric—perfect for a little girl or boy from a family of makers, crafters and builders! 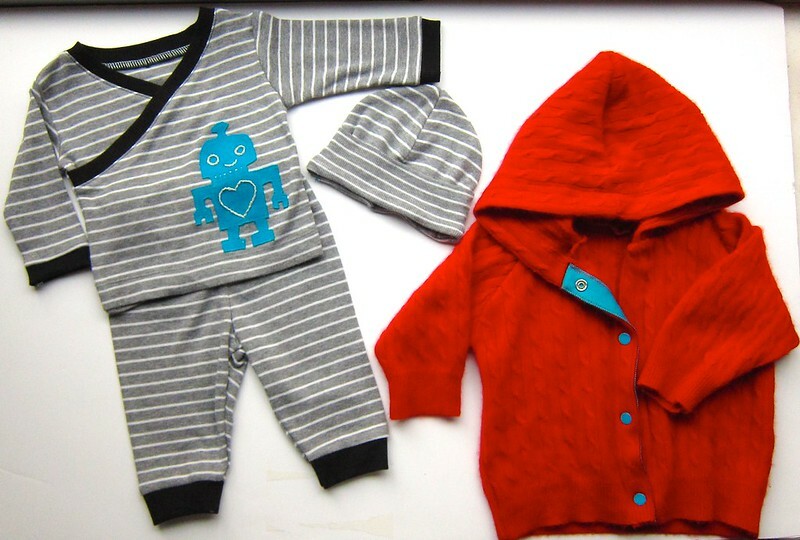 Set #2: Gray and red and blue with a robot: Another knit baby set, plus a red cabled cashmere cardigan hoodie. The kimono top and pants and hat are from the same patterns as set #1. The main fabric is a super-soft cotton/rayon rib knit I cut out of a top from a giant bag of second-hand maternity clothes I bought for a song from a local mom (I have plenty of things to wear for the next 6-8 weeks, don't worry). Immediately after it was done I decided it was too boring and needed an appliqué—my husband suggested a robot would be just the thing, and I think he was right. 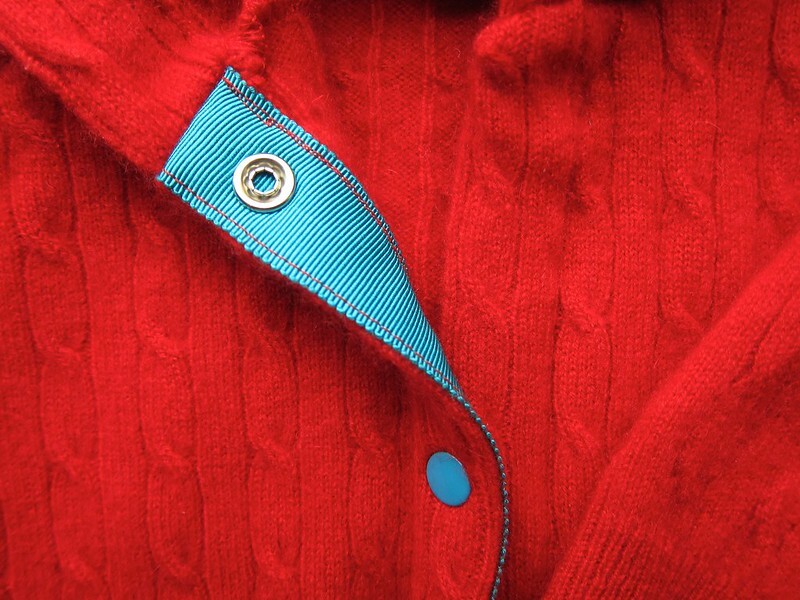 The red cashmere cardigan hoodie is my TNT baby hoodie from Kwik Sew's Sewing For Baby—this is my fourth version. 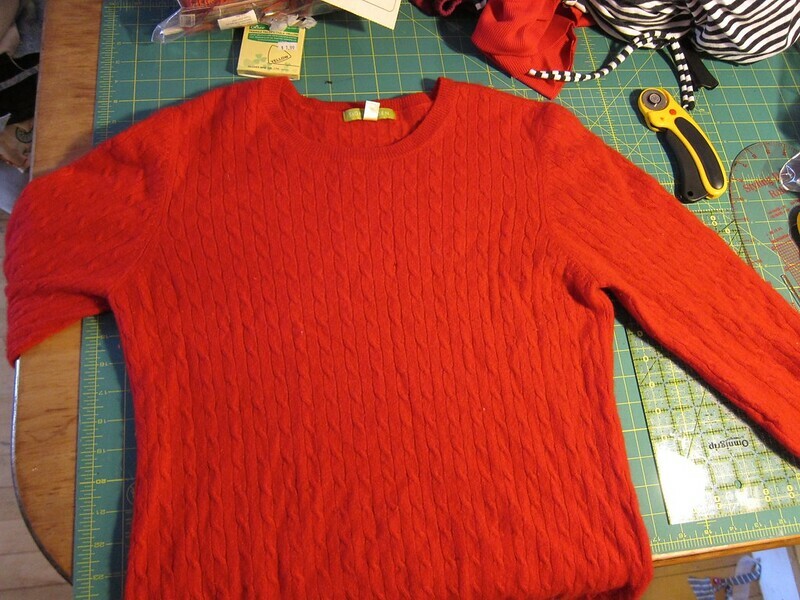 I cut it from a super-soft designer thrift-store sweater that had some stains and snags. The best part was I didn't have to attach any sleeve cuffs or bottom waistband—I just cut the pattern to include the original ribbing. I stabilized the front facings with bright turquoise petersham ribbon from Pacific Trimming and applied blue snaps from Sew Baby. I was going to put an appliqué on this piece too, but decided it didn't really need one. Don't you love a pretty piece of petersham or grosgrain in a sweater? (And no, I haven't finished applying the inside snaps yet). And that's good, because yesterday my midwife ordered me onto scheduling resting (basically part-time bedrest) due to some severe swelling in my legs and feet and other assorted reasons. I need to spend half my days in bed lying on my left side, and minimize time standing/sitting. So... I sense a lot of embroidery and knitting in the next weeks, and not so much the sewing machine. Anyone else been through this? The thought of lying down so much is driving me crazy... 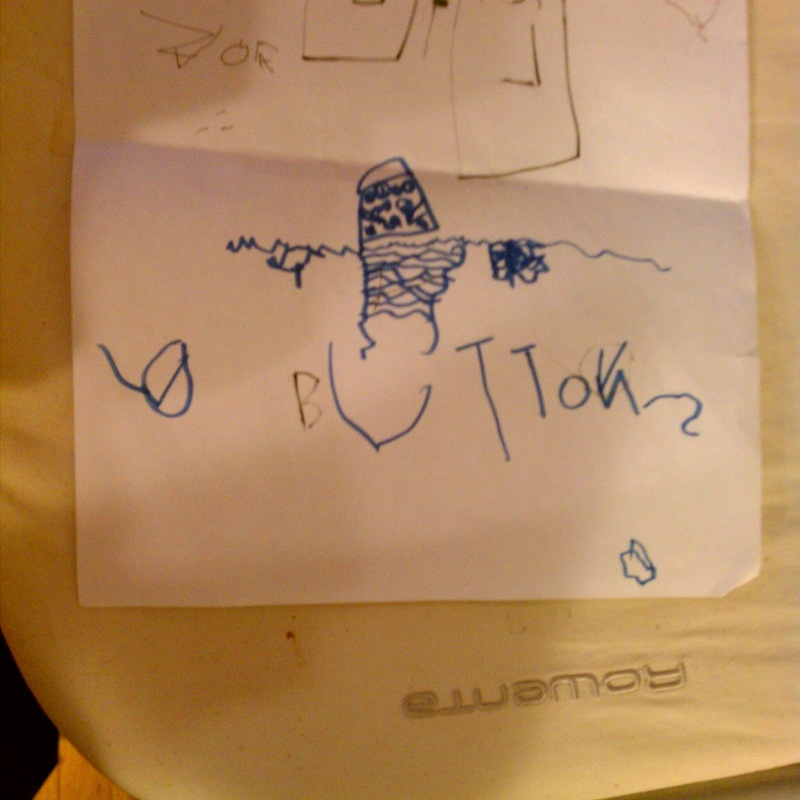 I'm a doer and a maker and I've got a demanding full-time job to do and a four-year-old to chase around! And my apartment is so NOT baby-ready, and I know I'll be too exhausted once baby actually arrives to do much of anything but nurse and sleep (when I can). This is adorable! 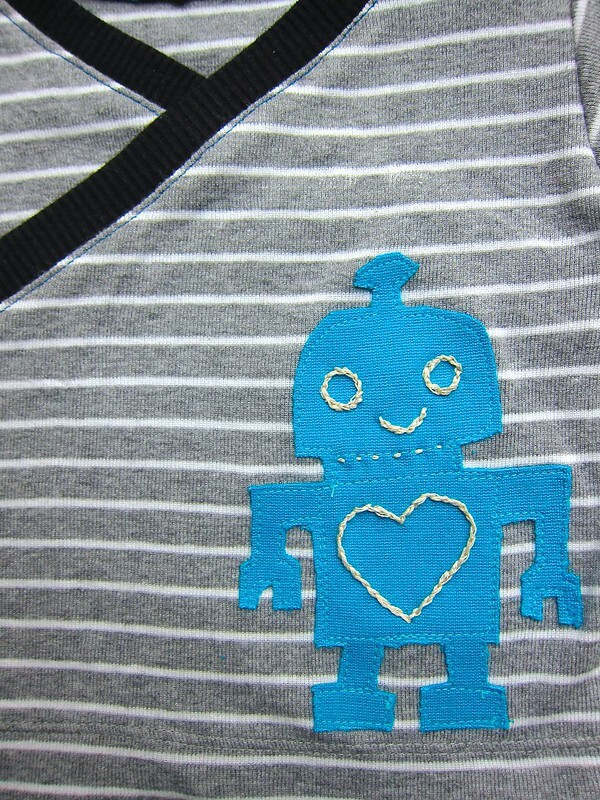 The cashmere baby sweater looks very professional and the robot applique inspired me for the gift I am planning for my soon to arrive niece. All of the garments you made look fabulous. I spent 4.5 months on full time bed rest. It's hard. It's boring. The outcome is totally worth it. Yes, boredom for sure, though I am not even full-time, just more "scheduled resting." But baby is top priority of course! Adorable outfits! I'm sorry for the bedrest, I had lots of swelling my second time around too. I will say the fatigue after the newborn was a lot better the second time around though. I think your body is accustomed to being on full-time mother mode and you'll be surprised how much Z helps you - "Honey, can you hand mommy those wipes?" Hang in there! Those are so stinkin' cute! I'm really hoping I can get in some sewing for baby #2 before he/she is born, but with a HIGHLY energetic 18 month old in the house I'm not sure how probable it is that it'll happen. I hear you... I don't think ANY sewing would have happened if Z wasn't a four-year-old... when she was 18 months old she was still waking up in the night every few hours! It's a bit shorter than the neckline—I stretched it gently as I sewed and made it even a bit shorter than the pattern, so it would hug the baby snugly. I can definitely catch up my blog reading, that's true! Nesting at its best! So adorable. Love the cashmere sweater save, and the turquiose ribbon is such a nice touch. The sweater buttons are beautiful. It's not like if you could find that sweater RTW that it would have been cheaper than the materials! Here thrift shops are not such reliable sources of a volume of baby clothes (we gave away ours) so I bought secondhand online with a inexpensive shippping to a pickup point. Yeah, I do online secondhand shopping as well... I got most of my maternity clothes from batches on eBay. Maaaaannnn, don't make me be Older Mom/Debbie Downer here. You're not being a downer, it's a very real safety concern. I sewed those buttons on incredibly tightly with many, many thicknesses of thread, many knots and extra wrapped around, but it's something I'm aware of as well. (I would never put buttons on a baby toy or doll for example, or even on machine-sewn baby clothes). I have made sweaters before with very short ties or snaps or no closures at all but I don't intend to leave baby unattended in this sweater or just lying around napping, and I suspect baby will outgrow before even getting to the point of being able to chew on or reach the buttons. P.S. I should also add that I will be handwashing that sweater and checking the secureness of the buttons each time I wash it and each time baby wears it. I love that you up cycled a cashmere sweater. Genius! 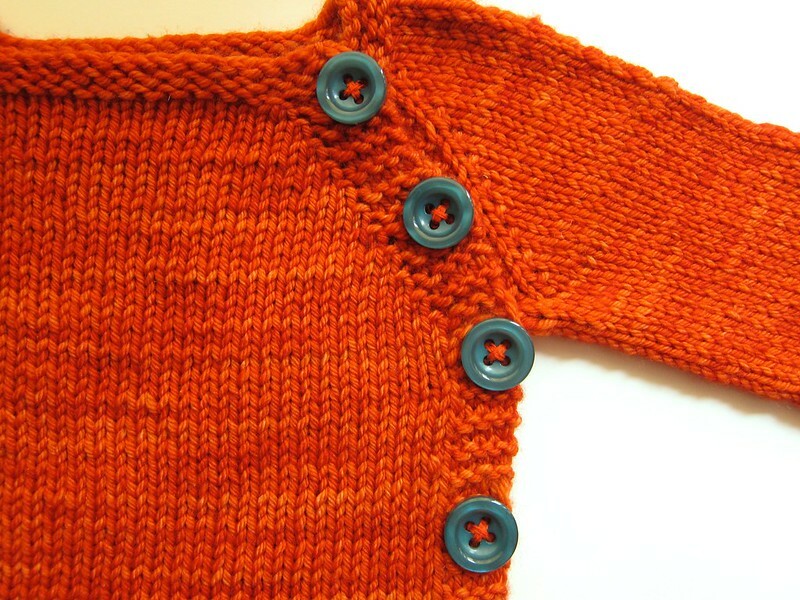 And baby Jane had buttons on several things her aunt knitted for her. No biggie. I just kept an eye on her and didn't let her sleep in anything with buttons. Hope you are feeling well!